For the past two months I have been keeping my nose down and sticking to business. My wife gave birth to our second child, Sofia Karin Stoll. This has been the most challenging time of my life, in addition to running my company and, of course, preparing for my blue belt grading. Now that everything is falling back into place, I will be again more consistent with my mental release here on Got Jits. I found time to read a couple books while away from writing, and will be bringing that stuff up as well. Now that I have a new belt around my waist, my focus will be on putting together an even better game plan. Not that the belt has anything to do with it because I still fight the same, but now there is no "etched in stone" curriculum and I can work with my professor to establish some custom attacks and defenses now that I have a better understanding of the Brazilian Jiu Jitsu. But I see this as just a new beginning, I am a white belt all over again and it feels fine. P.S. Congrats to everyone who graded and passed. Jason and Timmy put on a show as they passed their Purple Belt grading. Timmy chose me as his grading partner and got to experience his sharp skills first hand, a true honor. Thank you, Timmy. 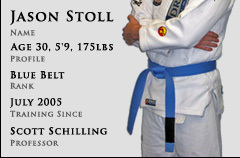 And Chris also walked away with a well deserved Blue belt around his waist.